Where the environment meets San Francisco politics. Lawyers for Clean Water, Inc.
We hope you can join us at El Rio for early Happy Hour drinks this Friday July 21st, 2017! El Rio will donate the proceeds to the SFLCV & we’ll use it to keep fighting the good fight - outreach, our next endorsement slate, and voter education! The San Francisco League of Conservation Voters urges you to vote YES on Propositions J & K. Proposition K will increase our sales tax* to 9.25% & Proposition J would allocate those funds to go to a Homeless Housing and Services Fund and a Transportation Improvement Fund. Under these proposals, of the 0.75 cent sales tax increase, a quarter-cent will go toward homeless services and a half-cent will go toward transportation system improvements. In the first full year, those amounts are expected to be $47.75 million and $95.5 million, respectively. In addition to needed homeless services improvements, these measures represent an important investment in our transportation services including MUNI fleet and facilities repair, new BART cars, more complete (pedestrian & bike friendly) streets, and programs like Free Muni for youth. That said, these measures are far from perfect. Our biggest criticism is that, as this is a sales tax, Prop K is inherently regressive: poorer San Franciscans are impacted more than more affluent ones by raising the cost of everything. A far better way to fund transportation improvements is with a Vehicle License Fee (VLF) which much more fairly taxes the heaviest users of our streets and roadways with their repair and upkeep, especially because the largest portion of these measures' increased funding will go to street repair. The SFLCV will continue to advocate for a VLF. Housing and transit are two of the most serious issues our community faces. The SFLCV urges you to vote YES on Propositions J & K.
* Proposition K would increase San Francisco’s sales tax by three-quarters of a cent. Because a quarter-cent of the state sales tax will expire January 1, 2017 the actual sales tax rate would change from 8.75 percent currently to 9.25 percent under this proposal – on par with Oakland. In 2014, 56% of San Franciscans voted in favor of Prop E, a tax on sugary-sweetened beverages. Although the tax did not meet the 2/3 threshold to pass that was required at that time, garnering the support of 56% of the voting population was a significant achievement, considering the opposition spent over $10 million to defeat it. The manufacture of plastic bottles, glass bottles, and aluminum cans consumes resources, produces pollution, and the containers often enter the waste stream instead of being recycled. According to the EPA, only about 55% of aluminum cans and 34% of glass bottles are recycled. A reduction in the consumption of these beverages, combined with a switch to refillable water bottles, can lower the greenhouse gas emissions that result from the production and distribution of these beverages. A reduction in the consumption of these beverages would also reduce the demand for numerous sugar and sweetening crops, including corn, sugar cane and beet sugar. This has the potential to preserve natural habitat, reduce fertilizer and pesticide use, and to reduce transportation related impacts. In addition, the proponents of this measure intend that the funds raised by this tax also be used to encourage more public water fountains. Public water fountains are a significant way to address the water mining / equity problems that are created by shipping water-based products such as soda and bottled water from one part of the world to another. Taken together, these reasons are enough to convince us that the Soda Tax is not just good for health, but also good for the environment. Please vote YES on Proposition V.
*A recent study of Berkeley’s soda tax found that consumption of sugary beverages fell 26% (soda) and 36% (sports drinks) while consumption of tap or bottled water rose 63% since the tax took effect in March 2015. If you’re wondering why is the ballot so long this year, you could blame propositions such as this, which considers a planning ordinance that could have passed through the legislative process, but was instead punted to the voters by the Board of Supervisors. We support the intent of Prop X, which aims to protect industrial and arts spaces in the most rapidly changing parts of the City, but would prefer a legislative fix, along with the requisite outreach to impacted groups. This proposed ordinance would impose requirements for certain developments in the Mission and SOMA, through use of conditional use authorizations from the Planning Commission. Within these areas, developers would be required to replace certain uses (e.g. light industrial and crafts, arts activities or non-profit community space), based on the size of the proposed development and the current zoning designation. This measure does not consider whether the replacement effort would actually achieve the desired effect of retaining well paying jobs for lower skilled residents or keeping non-profits operating in the City. For instance, would the closure of a refrigerator repair shop in the Mission be replaced by a similar business or something like a drone prototyping facility able to pay market-rate rent? More likely the latter under this one-size fits all scheme. Similarly, there are few guarantees the displaced non-profits and arts centers would be able to return. Sponsors of this proposition seemed to recognize some issues with this proposed measure and allow changes by a super-majority of the Board of Supervisors. We would prefer they make this call in the first instance, after gauging effectiveness, feasibility and desires of the local communities most affected. The San Francisco League of Conservation Voters recommends NO on Prop X. Proposition O is a response to a measure limiting office development, Prop M, passed by San Francisco voters in 1986. Prop O would grant a waiver to development projects in Candlestick Point and Hunters Point, exempting them from the current citywide limit on office development (950,000 square feet per year). Prop O has been put on the ballot by Lennar, the company leading the redevelopment of the Hunters Point Shipyard. In the current economic climate, citywide, the number of office development proposals far exceeds the Prop M limit, and this would allow more development at the Shipyard, which is currently slated for 5 million square feet of office space. Some advocates for investment in the Bayview support the measure, and we generally support investment in this under-served neighborhood that benefits existing residents. However, part of the goal of Prop M in 1986, and a continuing goal for the city, is to make sure new development is supported with sustainable transportation infrastructure, as well as affordable homes for the people who do the jobs it generates. Prop O would fast-track office development in a place where public transit is woefully inadequate. New jobs -- and homes -- should be built close to public transit in order to reduce car use and ensure the city grows sustainably. But Prop O takes limits off development with no good plan for improving transportation services for the thousands of new workers and residents in the area. There are also additional concerns around delays in community benefit payments and affordable housing development on the site, important components of sustainable development. Prop O is ballot-box planning, not a good government practice, and could set a precedent for more of the same. The San Francisco League of Conservation Voters urges you to vote NO on Measure O. Gifts, including (to close a loophole) paying for travel through a third party. Lobbyists would also have to disclose which agency, commission, or official they’re targeting. The San Francisco League of Conservation Voters supports good governance, and this is a measure that will help create a more transparent and democratic process for our city. Vote YES on Measure T.
Build new affordable units off-site, equal to 17% - 20% of the total units. A unit for sale counts toward the on-site requirement if it is affordable to households earning up to 90% of the area median income. A rental unit counts toward the on-site requirement if it is affordable to households earning up to 55% of the area median income. The City uses federal income standards to determine the maximum allowable rent levels for the affordable units. Generally, a household living in an affordable housing unit pays no more than 30% of its total income on rent. Currently, the monthly rent for a one-bedroom affordable housing unit is $1,121, and the monthly rent for a two-bedroom affordable housing unit is $1,261. Under Proposition U, a rental unit would count toward the affordable housing requirement if it is affordable to households earning up to 110% of the area median income, double the current cutoff. This means, a household could pay up to $2,241 for a one-bedroom affordable rental unit and up to $2,521 for a two-bedroom affordable rental unit. As a result, developers would be tempted to rent only to households approaching 110% of the area median income to maximize their income, leaving out lower income households who need affordable housing the most. The San Francisco League of Conservation Voters suggests NO on Prop U. The City provides financing to developers to build new affordable housing and rehabilitate existing affordable housing on City-owned property. The Mayor's Office of Housing and Community Development (MOHCD) administers most of these programs. MOHCD posts a description of the proposed project on its website and invites developers to submit proposals. Because building and managing affordable housing projects offer lower potential profits than market-rate projects, these projects attract proposals from fewer developers. MOHCD describes the criteria they will use to select a proposal, which generally include the anticipated cost to the City, how much experience the developer has with similar projects, the feasibility of the developer’s proposal, the quality of the developer’s design, and the extent to which the proposal meets community needs. After the deadline for submissions, MOHCD applies the evaluation criteria to select a proposal. Proposition P would require MOHCD to receive at least three proposals for the project and accept the proposal with the “best value.” Currently, MOHCD may select a qualified developer to proceed with an affordable housing project, even if it receives fewer than three proposals. If Prop P passes, the City could not proceed with an affordable housing project if MOHCD receives fewer than three proposals. The San Francisco League of Conservation Voters believes that this requirement would reduce the development of affordable housing and make the city’s housing crisis worse. Please vote NO on Prop P.
Currently, the Mayor appoints all 7 members of the Metropolitan Transportation Agency (MTA) Board and the Supervisors confirm these appointments. Proposition L amends the process such that 4 of the 7 members of the MTA Board would nominated by the Mayor and the remaining 3 by the Board of Supervisors, all of whom would still be confirmed by the Supervisors. In addition, the amendment allows the Supervisors to reject but not modify the MTA's budget by simple majority, rather than by 7 of the 11, as now. If the Supervisors reject the budget, it would have to fund MTA sufficiently to maintain all operations at the level of June 30 of the prior fiscal year. The amendment does not otherwise change the budgetary or financial responsibilities or authority of the MTA Board. The MTA is constrained by many who do not want to give up lanes and parking spots for street changes that improve pedestrian, cyclist and motorist safety. Such improvements include sidewalk widening and curb extensions, Muni boarding platforms and protected bike lanes, which would contribute towards achieving Vision Zero reductions in deaths from collisions. District Supervisors represent local interests and are more likely to appoint those from their districts who rate parking places over safety changes. The Mayor reports to all San Franciscans and is more likely to appoint strong Board members. Prop L would reduce the current requirement of a supermajority (7 of 11 Supervisors) to reject the MTA budget to a simple majority, thus making it easier for Supervisors to hold the MTA budget hostage to local interests. Prop L would make transit planning more vulnerable to political meddling. The San Francisco League of Conservation Voters urges you to vote NO on Prop L.
A sustainable community provides a healthy environment for its residents, and this includes safe, affordable housing. On November 3, 1992, voters of the City and County of San Francisco approved the issuance of up to $350 M of General Obligation Bonds for a Seismic Safety Loan Program to provide loans for the seismic strengthening of unreinforced masonry buildings. Since then, the City has issued approximately $95.3 M in loans, and there remains approximately $254.7 M of unused bond capacity under this loan program. Providing loans to finance the costs to acquire, improve, and rehabilitate and convert at-risk multi-unit residential buildings to permanent affordable housing. Performing needed seismic, fire, health, and safety upgrades and other major rehabilitation for habitability. It comes as no surprise that Prop C has received broad support from all 11 of the District Supervisors. The San Francisco League of Conservation Voters agrees: Please vote Yes on Proposition C.
San Francisco has one of the smallest tree canopies of any major US city. Not only do trees help fight climate change globally by taking up carbon, they help us manage climate change with shade and insulation. Trees also make for a more walkable, livable and sustainable city. Current city policy exacerbates our lack of trees by requiring property owners to maintain most street trees, and fix sidewalks buckled by trees, whether or not they have the resources to do it. Existing trees are harmed because of this policy, which also discourages people from planting new trees. Prop E transfers responsibility for street and sidewalk maintenance back to the City. Prop E dedicates funds for tree care by setting aside $19 million per year from the City’s General Fund. These dedicated funds include a specific allocation of $500,000 per year toward San Francisco Unified for tree maintenance at public schools. Until now, there has been little or no funding to support such efforts to create a safe, green, and pleasant environment for children, teachers, and staff. It also includes enough funding to maintain 50,000 new trees. Prop E does not put money toward planting new trees, but there are many sources for that funding. Maintenance is the missing piece. Though budget set-asides are not always a good government practice, there are times when they are an effective way to fund important city priorities that often lose out in budget battles. The San Francisco League of Conservation Voters strongly supports Prop E for a greener, healthier city. Vote Yes on Proposition E.
It is no secret that BART is struggling. An aging system, coupled with enormous ridership surges, is contributing to capacity challenges and system delays. BART has identified $5B of capital investments to bring the systems into the 21st century and to meet future growth and demand. Proposition RR will go a long way toward addressing these problems. The $3.5B bond will focus on replacing or upgrading core operational components of BART’s existing system that include new train control and signals, electrical system, track replacement and tunnel repair. Additional funds will go toward improving crowding and accessibility, such as escalator upgrades. Currently, BART moves on average 450,000 people throughout the region every single day. When BART experiences major systemwide delays and shutdowns, that impact is felt by everyone. It is also a major contributor to the economic vitality and quality of life for the City of San Francisco and the Bay Area region. A safe, reliable transit system that is able to serve a growing population is fundamental to a healthy environment and its residents. The San Francisco League of Conservation Voters endorses YES on Prop RR. San Francisco’s booming job markets, people’s desire to live in attractive walkable communities and the natural attractions of San Francisco’s environment has attracted population growth, tightening the housing market, increasing rents and forcing many renters out. Builders of large multi-unit housing projects are required by our Inclusionary Housing Ordinance to include a certain percentage of “affordable housing,” Prop C would raise that percentage and allow the Board of Supervisors (BOS) to adjust it further. We also support Prop C’s removal of operational requirements from the Charter. In San Francisco, we love our parks, and in this dense city, we depend on them to act as our backyards and living rooms too. Excellent parks are a critical part of a sustainable city. But San Francisco’s parks are suffering after years of shrinking funding. The SF League of Conservation Voters supports Proposition B, which would renew the city’s Open Space Fund to bring in an estimated $1 billion over 30 years for city parks, without raising taxes. Vote YES on Prop B on June 7, 2016. The Sustainable Parks Funding measure, or Proposition B, is a city charter amendment that would renew the Open Space Fund first passed by San Francisco voters in 2000. That fund is set to expire in 15 years; this measure would extend it through 2045-46 and would gradually increase over time from the current level. Measure B was placed on the ballot by Supervisor Mark Farrell and supported by Supervisors Avalos, Breed, Campos, Cohen, Farrell, Kim, Mar, Wiener, and Yee. The measure enjoys broad support. Over time, park maintenance funding in San Francisco has dwindled. In lean years, the City cut the park budget; in good years, that funding has not been restored. This has led to a crisis situation: today, according to the SF Parks Alliance, the vast majority of park maintenance funds are going to emergency repairs. That’s unsustainable, both economically and environmentally. Though San Francisco voters have generously approved bond measures for parks in 2012 and 2008, these are only for capital improvements. By state law, bond funds cannot go toward maintenance, the day-in day-out attention that keeps our parks clean, green, and safe for everyone. Proposition B builds upon the Open Space Fund passed by voters in 2000, which aimed to provide a sustainable funding source for parks. Proposition B will ensure the City’s General Fund set-aside for the Recreation and Parks Department cannot fall below 2015-16 funding levels, gradually increases over time, and ensures stable funding for the next 30 years through 2045-46. The measure would require the Recreation and Parks Department to set goals and measures, develop a five-year strategic plan, and set annual operation and capital spending plans. These plans would also have to include a new equity analysis, comparing existing Recreation and Park services and resources in under-served communities with those in the City as a whole. The plans would have to include strategies to address the findings of the analysis. These annual plans, including the equity report, would be presented to the Recreation and Parks Commission and Board of Supervisors. This should bring more accountability to the Recreation and Parks Department and make its spending decisions more transparent to the public. It should also make sure that public spaces in the city’s most disadvantaged neighborhoods—where parks are most needed—stay safe and clean for all. The primary argument against Prop B is that it is a set-aside, which on good government principles is not something that the SFLCV generally supports. Set-asides restrict the ability of public agencies and elected leaders to allocate resources based on changing needs—based on more information than voters generally have. This is why Supervisors Tang and Peskin did not vote for Prop B. However, set-asides allow voters to set general priorities for their leaders, and there are examples that work well, most notably the Library Preservation Fund. Parks, like libraries, are broadly important but easily ignored in the budgeting process; we believe that the history of chronic underfunding makes this measure worth it. Parks, like libraries, are heavily used by San Francisco residents, who will all benefit from better maintenance of public spaces. The measure has some safety valves, too: it is based on revenue (rather than requiring a certain amount of spending), and its growth can be suspended in years where a major budget deficit is forecast. Prop B has also been opposed based on questions about the Recreation and Parks Department's management of funds and about privatization. We would have liked to see a plan for how additional funds will be spent. However, the reporting requirements should help address these concerns by bringing more accountability and transparency. Overall, the San Francisco League of Conservation Voters strongly supports Prop B to provide funds to maintain our parks, giving all San Franciscans access to the pleasant outdoor spaces that help make life enjoyable in our dense, sustainable city. June 2016: Vote YES on Measure AA for a Clean and Healthy Bay!!! Funding is desperately needed to restore San Francisco Bay’s wetlands and help protect the region from the effects of rising seas. This modest $12 annual parcel tax would be evenly distributed among all parcels in the nine-county Bay Area. Over 20 years, it would raise $500 million to restore wildlife habitat, improve water quality, and create a buffer against storms and sea level rise. VOTE YES ON MEASURE AA on June 7th, 2016! The Clean and Healthy Bay ballot measure, or Measure AA, is a region-wide $12 parcel tax that is expected to raise to $500 million dollars for wetland restoration during its 20-year lifetime. Revenue from the tax would be earmarked to restoring wetlands along San Francisco Bay (until the tax expires in 2037). Measure AA requires a two-thirds majority to pass. Measure AA was placed on the ballot of all nine Bay Area counties by the the San Francisco Bay Restoration Authority, a regional agency formed in 2008 to support the restoration, enhancement, protection, and enjoyment of Bay wetlands and wildlife habitat. The parcel tax is being championed by a broad array of supporters, including both environmental and business groups, such as Save the Bay and the Silicon Valley Leadership Group. The funds raised will help meet regional wetland restoration goals, which have stalled for lack of funds, and address long-term needs to protect infrastructure and homes from sea level rise. Scientists estimate as much as 90% of the historic wetlands around San Francisco Bay have been lost to development and agriculture. A decade-long goal to restore 100,000 acres of wetlands--to maintain vital bird habitat, enhance water quality, and protect our cities from tidal surges--has stalled in recent years, as funding has dried up. Lands are already available for restoration, particularly in the North and South Bay, but funding is needed to actually do the restoration. Measure AA would pay for that wetland restoration. It would improve water quality and increase natural habitat for hundreds of species of wildlife, including salmon, Dungeness crab, porpoises, sea lions, and shorebirds. Restoring San Francisco Bay’s wetlands will also protect shoreline communities from from flooding, which is likely to reach crisis proportions in the coming decades as sea level rises. More than $60 billion worth of homes, businesses, and crucial infrastructure are at risk, including ports, airports, roads, office buildings, and entire neighborhoods at or below sea level. Restoring wetlands will help with this by helping absorb and buffer against rising tides and storms. Measure AA is generally unopposed throughout the region, with the exception of taxpayers’ associations, which reflexively oppose taxes. The main argument against the measure is that all parcels are taxed at the same rate-- that is, Facebook and Google pay the same as owners of individual homes. Though we certainly support more funding from large tech companies for Bay restoration, the tax is a broadly affordable $12 and will support something that cannot wait--the restoration of our Bay. The November 2015 election is upon us, and as usual there are several important "Votes for the Environment"! We particularly urge you to vote No on G, Yes on H and for Aaron Peskin for D3 Supervisor. See all our endorsements below, and follow the links for more information. Note that if we did not list a Ballot measure or Race, it is not because it is not an important issue, only because we did not feel there was a clear environmental or good government reason to endorse, as per our mission. Don't forget to VOTE on Tuesday, November 3rd! 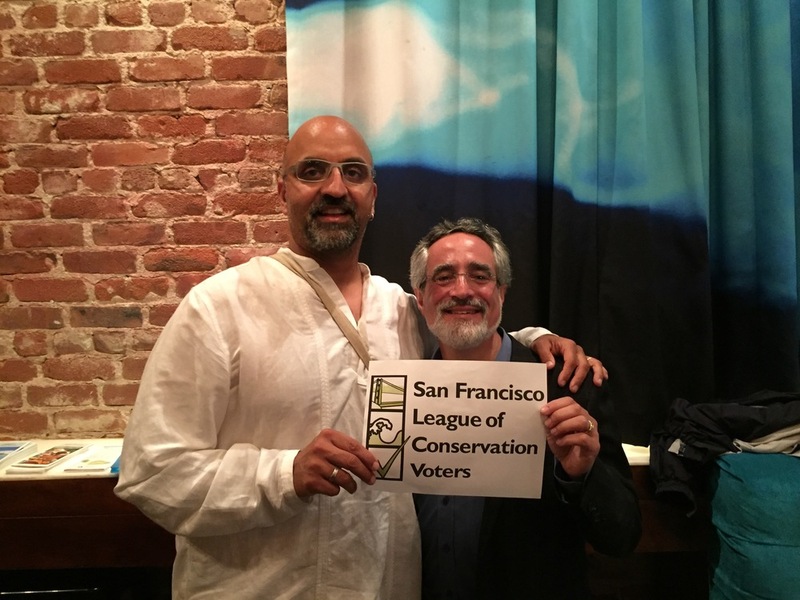 The San Francisco League of Conservation Voters endorses Aaron Peskin for the Board of Supervisors for District 3. Aaron is a long-time environmental champion, and we have enjoyed working with him over the years, both on and off the Board. As a Supervisor, and then President of the Board, Aaron took strong positions on protecting the Bay, funding public transit, and enhancing San Francisco’s open spaces. We look forward to working with him again on the Board of Supervisors and urge you to Vote for Aaron Peskin for District 3 Supervisor. No issue in San Francisco seems more acute than our current housing crisis, and to be sure it is an environmental issue. Vibrant, socioeconomically, diverse cities are the best way to prevent suburban sprawl and its attendant environmental problems such as resource-intensive living and habitat destruction. Unfortunately, cities across the country are facing similar problems of housing demand outstripping housing supply. Proposition I is a well-meaning attempt to address part of this crisis in the Mission district, one of the San Francisco neighborhoods most affected. Long term residents and businesses in the Mission are dealing with a dramatic increase in property values which is, in turn, leading to a high number of evictions and a rapidly changing neighborhood character. Prop I would establish an 18 month moratorium on housing projects that do not contain 100% affordable housing (with possibility of a 1 year extension). In that time, the City would be required to come up with a Neighborhood Stabilization Plan which would propose ways to help the Mission reach 50% affordable on new construction going forward. While we strongly believe more must be done to address San Francisco's housing crisis and the affordability issues it creates, we believe Prop I will likely not improve much and will more likely cause greater harm. By stalling new housing construction, even for luxury units, without addressing demand, Prop I will most likely cause the already sky-high value of existing housing stock to increase, fueling still more speculation, and more evictions. While it is critical to build more affordable housing in San Francisco, and in particular to the Mission, Prop I does nothing to actually address the issue of creating more affordable housing. In addition to this measure's practical limitations, we also dislike the fact that this is essentially ballot-box planning. However much we may agree with the intentions behind the measure, to protect the City's affordability, socio-economic diversity, and character, we urge you to vote No on Proposition I. Proposition D is a vote for the Mission Rock project, a waterfront development proposed on what is now a large parking lot, across Lefty O'Doul Bridge from AT&T Park. Specifically, Prop D would raise waterfront height limits from 40 feet, to up to 240 feet, on a piece of SF Port property mostly zoned for open space. Proposition D reached the ballot due to voter approval of Prop B in 2014, which required voter approval whenever a development plans on exceeding the 40-foot height limit along the waterfront. The site, known as Lot A, is currently a vast surface parking lot that holds 2,300 cars. The rezoning would allow the Giants to move ahead with a plan that calls for 1,500 units of housing, 8 acres of parkland, 1.5 million square feet of commercial space and a new brewing facility for Anchor Brewing Co. at Pier 48. The parking will be replaced by a garage on the southern end of the property. Forty percent of the new homes will be affordable. About half of this will target middle-income families earning more than 120 percent of area median income, $122,300 for a family of four. The rest will start at 55 percent of AMI, $56,000 for a family of four, and go up from there. Prop. D is opposed by the Sierra Club, San Francisco Tomorrow, Livable Cities and the Coalition of San Francisco Neighborhoods. Opponents say the proposed buildings are too tall, the project has too much parking, and the property should be used for open space, in keeping with the state public trust laws that preserve public access and limit use of the public waterfront lands to mainly maritime and water-related recreational uses. Mission Rock will be San Francisco’s first Type 1 Eco-District – the city’s highest environmental standard, meaning that a community has a set of energy, water, transportation, and waste targets to achieve. All buildings shall be designed to the LEED Gold standard (with specific requirements for water targets above and beyond LEED). Consideration of sea level rise and implementation of open space parkland along the waterfront. SFLCV urges you to vote YES on Prop D.